Venezuela is an incredibly dynamic country. After several decades of stability, the country has been shaken by major political realignments, economic shifts and policy changes since El Caracazo took place in 1989. In that year, the population rose up violently in response to the government's economic reforms that included increases in the price of gasoline and transportation. This became a caution and model for recent political maneuvers by both government and social groups. Since that event, the country has had two decades of instability, wading through two failed military coups in 1992 and 2002, the collapse of the party system in less then a decade during the 1990s, the creation of a new Constitution in 1999, a referendum to remove Chávez from power in 2004, a referendum to approve the indefinite reelection of the president in 2009, Presidential Elections in 1998, 2000, 2006, 20012, 2013, and the unexpected death of Chávez in early 2013. 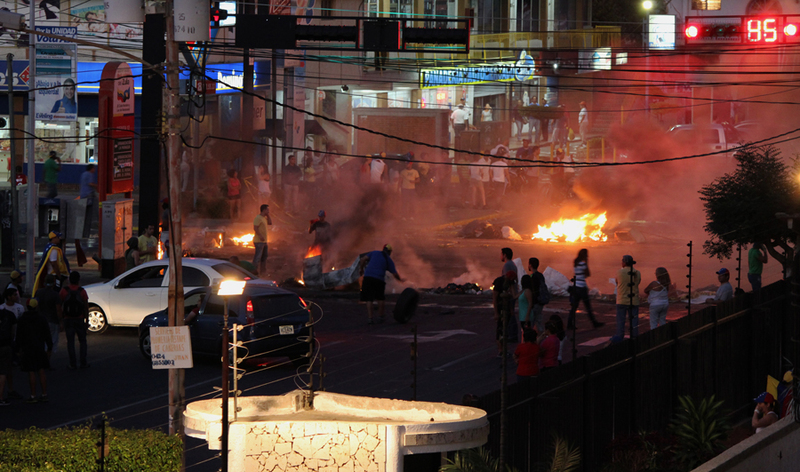 The massive protests that are taking place all over the country (Caracas, Mérida, Valencia, Maracaibo, Coro, Porlamar, Barquisimeto y San Cristobal) in the first trimester of 2014 are a clear sign of the accumulated social unrest and polarization, but also of an institutional deterioration characterized by the absence of effective mechanisms to alleviate those tensions. In the following lines I present what I believe are the three critical factors that are pushing the country to its limits: a) The state of the economy; b) Social tensions, inequality and the rhetoric of polarization; and c) The absence of “fair” elections in the short term. On January 15, 2014, Venezuelans, concerned with another devaluation were anxiously awaiting the President´s State of the Union Address. After 45 minutes of greetings and applauses by members of the president’s party in the Asamblea Nacional, President Maudro made it clear that the official (fixed) exchange rate would be maintained at 6.3 bolívares for a dollar throughout 2014. When his speech began, the parallel (black-market) exchange rate was set at 62 bolívares for a dollar, but once his 4 hour speech -during which the president was flanked by a 6 ft. tall image of Chávez- was over, the bolivar in the parallel market went up to 73 bolívares for a dollar. Two weeks later, it reached 80 bolívares for a dollar. According to The Economist, the inflation rate in 2013 was slightly above 56%, the highest in the region -followed by Argentina with 28%¾ and the highest in the country since the 1950s.1 For the economist Pedro Palma, professor at Institute of Higher Administrative Studies in Caracas (IESA), the causes of high inflation in Venezuela can be explained mainly by the economic and policy decisions applied by the government.2 The high levels of spending, and the growing debt, have caused a huge deficit (calculated in more than 4.5% of the country´s GDP for 2014) in the public finance3. The Central Bank (BCV) is one of the main lending institutions within the public sector and PDVSA, the state administrated oil company, has accumulated a big part of this debt, which by the end of 2013 exceeded 408 billion bolívares (65 billion US Dollars). These policies have been accompanied by a massive printing of generating a significant increase in the money supply and, consequently, in prices and levels of consumption. People do not want to hold money that will be worth 10%, 20% or 50% less the following week or month and this explains the waves of panic consumption we have observed in the last six months and that are very common in countries suffering from hyperinflation. President Maduro said he would strengthen the economic model introduced by his predecessor and called for a plan against the increasing crime rate (Venezuela has one of the highest crime rates in the region4). Besides announcing that the official exchange rate would remain intact, he explained that all subsidized dollar exchanges would now be handled by Foreign Trade’s national center. Most analysts perceived the package of economic measures as a ”veiled devaluation.” Another major economic announcement was that the government price control scheme was to be reinforced and a new law prohibiting businesses to earn more than 30% of profit margin for their products was to be enacted (Ley de Precios Justos)5. These policies have been a major strike for the private sector in the country. Small and large companies find it extremely hard to adapt to the unstable macroeconomic conditions (inflation and no access to the foreign currency market to import goods), but they are also struggling to adapt to the internal market (over) regulations, which are extremely vague, incentivize corruption and generate confusion among producers (according to the world bank, Venezuela is the most difficult country in the region to start a business and among the hardest to do business in the world6). The government is aggressively auditing major companies and sanctioning them -they are literally arresting board members of private companies- for not following new regulations. The most recent example was El Dakaso, where the government imposed economic sanctions to one of the largest electronics supplier in the country (DAKA) accusing it of “usury” and allowed hundreds of people to plunder the DAKAstores during the electoral campaign held at the end of 2013. This situation partly explains why consumers cannot find basic products in grocery stores. According to the BCV, the scarcity index for the last trimester of 2013 is 28%, which means people cannot find 1 out of every 3 products they are looking for and explains why it is not possible to buy a new car in Venezuela today (there aren´t any for sale! ), why if you have a car you cannot repair it (there are no spare parts available), and why a 20 year old Honda Civic is worth 35, 000 dollars7. There are hundreds of market distortions in the Venezuelan economy and it seems that the government is not taking the proper decisions to improve the situation. These distortions become more tangible when you realize that you can fill up a car´s tank of gasoline with 20 cents of a dollar8, that buying a small bottle of water costs $1 dollar or that purchasing insulin is almost as cheap as buying two apples. In Venezuela absolutely everything is related to politics, even the things that seem to have absolutely nothing to do with it -things such as basic economic transactions and services, working force culture, tourism, exercise, grocery shopping, baseball or crime. After Chavez´s death, the government rhetoric is still as polarizing as with the former president, but pronounced by a significantly less charismatic president. Since 2002, the official discourse became extremely aggressive towards anyone who is not part of the “Bolivarian revolution,” and the political elite in power believes they were elected by “the people” to lead the ”battle” against the rich, oligarchs, and foreign interests (except those related to the oil industry). The Venezuelan working class is tired of crime, scarcity, poor services, and of standing in long lines for almost everything. Major cities around the country are suffering food shortages (milk, harina pan, oil, sugar, butter) and the lack of basic items (such as toilet paper). The government blames such scarcities on businesses that are siding with the opposition in a plot against them, but reality is that the lack of dollars in the economy makes it almost impossible for imports to enter the country, for production to pair the accelerated demand for goods, and for producers to adapt to high inflation rates. Most of the shopping centers in the city that used to sell imported goods (clothing, technology) are either empty or locked down. The high levels of economic inequality, accentuated by social polarization, can partly explain the violent context in the country. In contrast to the violence associated with drug cartels in Mexico, the violence in Caracas is class related (most homicides are related to armed robbery and assault) and most working class people are scared of being robbed, kidnapped or killed in major cities. The police and the military are seen as highly corrupt, police corporations are not coordinated within or between them, and the informal armed forces of Chavismo in the barrios (favelas) -like Los Tupamaros- are out of control10. These groups were formed after the failed coup of 2002 and used to informally respond to government officials. In the absence of the strong charismatic leader in early 2013, they spread all over the city and now represent a serious threat to public safety in the city. In the recent protest against the government, hundreds of armed people in motorcycles -also known as los motorizados- took advantage of the chaos to rob residential areas and assault people11. This dynamic has accumulated tensions between social classes for more than a decade, increased the levels of polarization in society, and today is moving people to the streets. If 50 thousand people gather in Altamira, a middle-upper class neighborhood in Caracas, or 70 thousand people concentrate at the Central University of Venezuela (UCV), the government calls for a massive concentration of 80 thousand supporters of the Oficialismo (the official party) in downtown Caracas to show their popular support. Institutions are not being used to alleviate social tensions; they are being used to accentuate them. President Maduro publicly recognized that silencing the media and bringing down the signal of NTN24 (one of the few cable signals that are not part of the Oficialismo information network based in Colombia) was a “State Decision.”12 Two days later, according to local media and confirmed by Bloomberg, the government agency in charge of telecommunications in the country (CONATEL) blocked the Twitter web page ¾the main communication platform used by the opposition¾ to prevent images and videos of protestors from spreading across the country13. Since Chávez won the presidency in 1998, Venezuela has had one of the most intensive election cycles in the region. There have been 22 elections (18 of them at the national level to elect the president or the parliament) organized by the National Electoral Council (CNE) in the last 16 years. The prelude of this electoral cycle (slightly more than one election per year) was the party fragmentation during the 1990s, a failed coup in 1992, a presidential election in 1993, and the victory of a political outsider in 1998. Political parties dramatically lost the levels of trust during the 1980s and after El Caracazo in 1989 the party system suffered a significant fragmentation (it rapidly transformed from a stable bipartisan system to a multiparty system). By the time the 1999 Constitution was approved, the word “political party” was completely eliminated from the constitution and replaced by “organizations with political ends” (organizations con fines politicos). With the new constitutional framework, opposition parties lost access to public financing and formal representation within the Electoral Management Body (EMB). The former affected the capacity of opposition parties to contend against the regime and the latter was a loss in the “checks and balances” system within the EMB, the subject that brought me to Venezuela for my dissertation. During this 16-year electoral cycle the electoral autonomy has suffered important shifts. When the Constitutive Assembly -dominated by Chávez supporters-created a new Constitution in 1999, it gave electoral administration the highest possible level of formal autonomy by recognizing the CNE as the fourth Branch of Power. This decision had a double effect: a) It signaled -nationally and internationally- that elections were going to be handled by an autonomous EMB, and b) it was a first step towards creating a legitimation mechanism that would have to be recognized by everyone: electoral democracy. Despite the creation of the Electoral Power, it became clear from a very early stage that what the CNE had won in paper -formally- it had lost it in practice -informally. The mechanism to appoint the directive board of the CNE required the vote of two-thirds of National Assembly members, but legislative gridlock led the Supreme Court (Tribunal Supremo de Justicia) -also with a Chavista majority- to designate a provisional board. The appointment mechanism and the lack of a balanced directive board within the EMB immediately generated a crucial distortion in terms of the levels of formal and informal autonomy. From the informal perspective, the story is quite different. With time, the credibility in the autonomy of the CNE has fallen significantly16. In 2004 the CNE was seriously questioned after the filtration of “la lista Tascón” (an official record with the names and signatures of citizens who convoked the 2004 referendum in order to remove Chávez from power, which was used with political ends). In 2005 opposition parties decided to withdraw from the parliamentary election and the official party, taking advantage of the situation, gained full control of the legislature. This allowed the regime to modify the Constitution and to appoint the new members of the CNE. Although councilors of the CNE are supposed to be independent, 4 of the 5 members had close ties with the President´s party. In addition to controlling this appointment mechanism, the list of factors that make elections in Venezuela extremely unfair are: a) unequal conditions to fund campaigns; b) the use of public resources to promote the incumbent´s party; c) unequal access to media; d) the use of the State apparatus with electoral purposes; and e) the administrative bias of CNE to share information with all political actors and to sanction all parties with the same criteria. Although voters in 2007 had narrowly rejected a referendum to abolish presidential term limits; two years later Chávez convoked for the second time a referendum to approve the indefinite reelection of the President. During this second attempt, he included indefinite reelection for mayors and governors in the referendum in order to secure their support and mobilization in favor of the motion. He won the referendum for indefinite reelection with 54% of the vote17. This event was probably a tipping point where the regime legally secured the possibility of implementing their long-term revolutionary program and elections became an effective pressure valve and the ideal mechanism to “legitimize” the regime throughout the region. International institutions, NGOs, and electoral observers can point the disproportionate use of State resources during -and before- the electoral process, but they have not been able to prove that votes are counted incorrectly. The intensive 16-year long electoral cycle in the country, the unequal conditions of electoral competition, the coordination problems faced by the opposition in a fragmented multiparty system, and the decreasing levels of informal autonomy -despite its high levels of formal independence- are some of the reasons why opposition parties do not see elections as a plausible path to power anymore. Additionally, there are no elections until 2015 and Venezuelans will not be able to elect a new president until 2019 -unless they go through a 3 million-signature recollection process again to call for a referendum in 2016. The levels of social unrest, paired with the economic crisis, make a 2-year waiting period seem very far away. Even if the country could hold elections before that, the opposition is constantly debating whether they should keep legitimizing the regime with elections that are almost impossible to win, given the high levels of inequality and undemocratic context in which they are competing, and withdrawing form elections as they did in 2005. Public institutions in Venezuela are not being able to respond to the levels social unrest in the country. The government´s violent reaction to social protest is aggravating the situation, their rhetoric against the opposition -and the private sector- is increasing the levels of polarization, and their economic policy seems to pay no attention to the economic history of Latin America during the second half of the twentieth century. The combination of recent events -an uncertain economic horizon, people on the streets, and institutional deterioration- are placing President Maduro in a delicate situation. He has not been able to replace the charismatic figure of Chávez or becoming the leading voice within Chavismo, where different blocks -political and military- within the regime might see this as an opportunity to maneuver against the current administration. There is no easy way out for Venezuela in the short term. However, political elites can always look back and rethink their decisions in terms of the lessons many countries in the region had to learn -in extremely difficult situations- during the last 50 yeas. Major economic decisions need to be enacted in order to reduce the macroeconomic instability, important policy shifts need to be instrumented in order to balance and program responsibly public spending and, most importantly, political elites have to reconsider their extremism, stop conceiving elections as a zero sum game, find the way to create more inclusive institutions, and commit with a framework that will allow them to interact in a democratic setting. 1 “Venezuela and Argentina. The Party is over.” The Economist. O1/02/14. 7 See: ¿Cuánto cuesta un Vehículo en Venezuela? 02.09.13. Noticias Venezuela. 8 When people go to the gas station in Caracas they usually take 15 bolívares(slightly more than $2 US dollars at the official rate or ¢ 18 cents of a dollar at the parallel rate). They pay around 4 bolívares for gas and tip the clerk with the rest! 9 Corrales, Javier, 2011. “Why Polarize? Advantages and Disadvantages of a Rational-Choice Analysis if Government-Opposition Relations Under Hugo Chávez.” In Eastwood, J., & Ponniah, T. (2011). Revolution in Venezuela: social and political change under Chávez. Harvard University David Rockefeller Center for Latin American Studies. 10 For more on public opinion analysis: www.datanalisis.com and http://varianzasvenezuela.blogspot.com/. 11 “Destacan papel regresivo de los colectivos”. El Universal. 14/02/14. Alejandro Trelles is a PhD candidate in political science at the University of Pittsburgh. His dissertation is about the formal and informal aspects of electoral autonomy in Latin America and Africa, and the effect that electoral autonomy has for democratic stability. He has fieldwork experience in Venezuela, Mexico, Ghana, Kenya and Egypt. His research interests are bureaucracy, organizational design, electoral institutions, political parties and representation. He has worked as an independent consultant in constituency boundary delimitation for the OAS and as a Principal Investigator in the Public Mapping Project.